If you click on the picture you can see it larger. 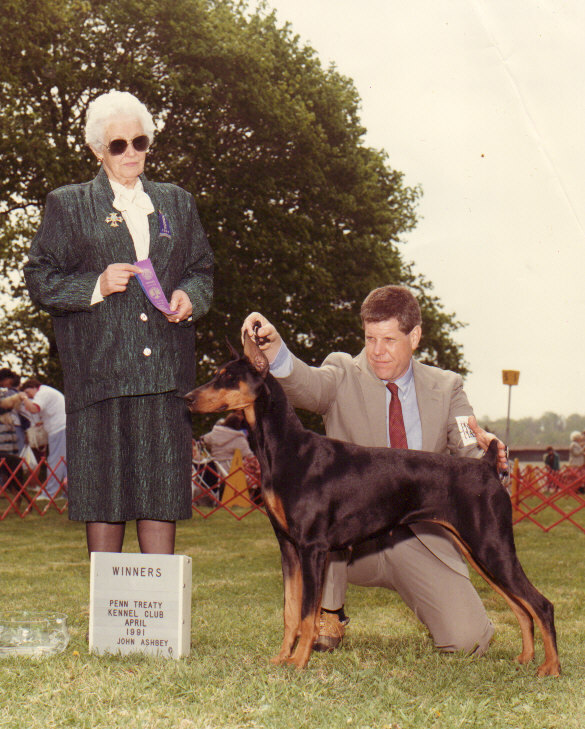 Click on the dobequest links to see pedigrees and more info on the dogs. Thank you for stopping, and enjoy your visit! 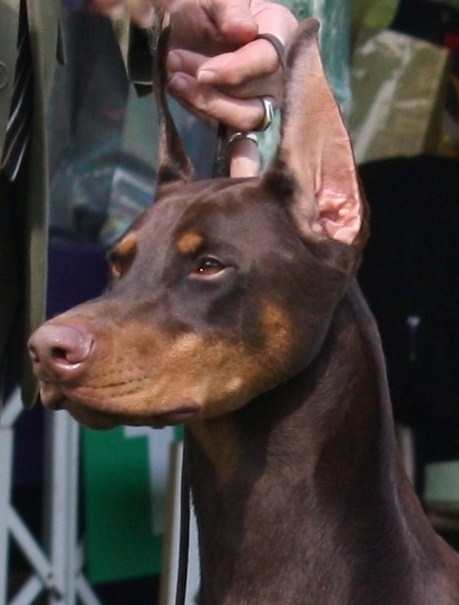 Welcome to Caleb Dobermans! The home of AKC Champion Doberman Pinschers, bred to be healthy, loving companions that are a beautiful reflection of the breed type. 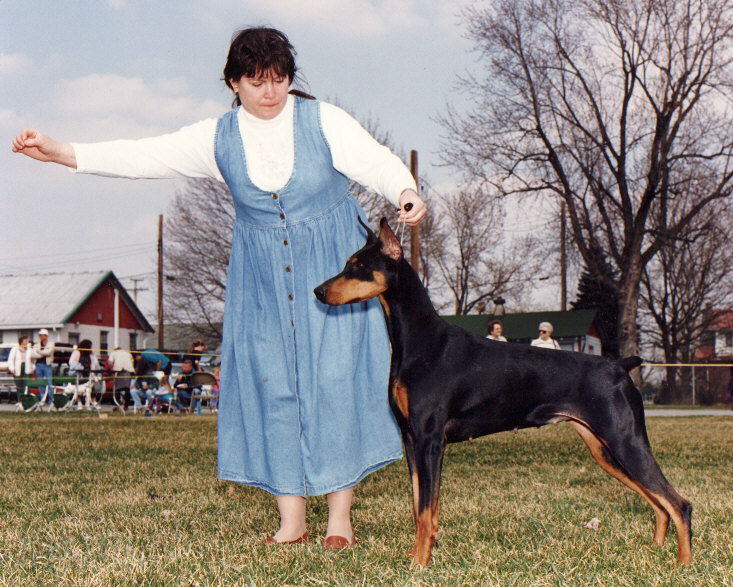 My name is Laura Jones and I live in Fleetwood, Pennsylvania (Southeastern). I have loved the Doberman breed my entire life. No dog can compare with the beauty, intelligence,alertness, protective and athletic ability of the Doberman. They truly posess the "Look of Eagles". 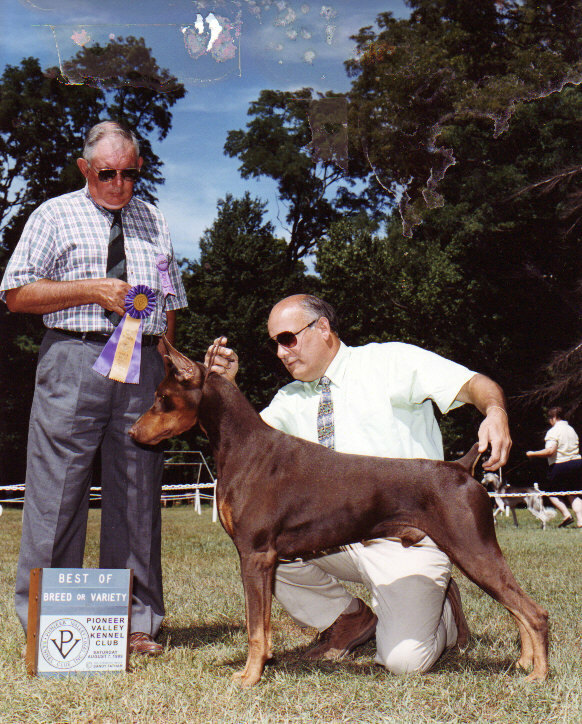 I bought my first show quality Doberman in 1990. 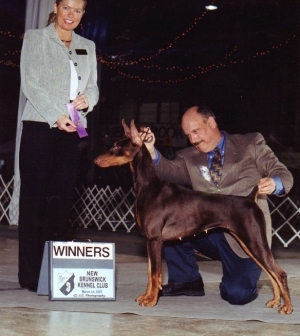 Her name was Shilah, and she went on to become my first champion, CH . Agape's Bright Morningstar. (CH. 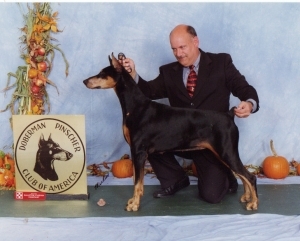 Agape's Lion of Judah x Redyn's Radiant Reflection)bred by Connie Galloway. Shilah lived to be eleven and is part of the DPCA Longevity Program. Here is a picture of Conner, CH. Caleb's Mighty Conqueror winning Best of Breed at a huge specialty under Breeder judge Ray Carlisle. 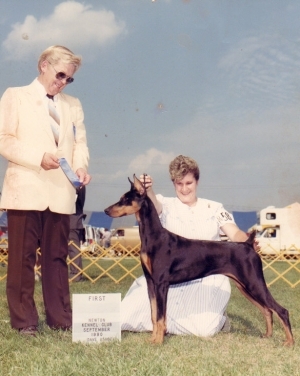 Conner was only bred four times, but he produced three champions in his first litter to Ravenswood Cotillion Waltz. CH. Ravenswood Footsteps N The Sand and CH. 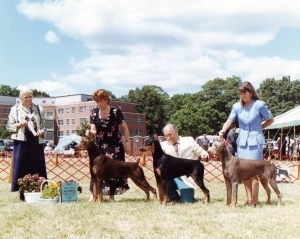 Ravenswood Show Vanistic both were Futurity and BOB winners and their sister CH. 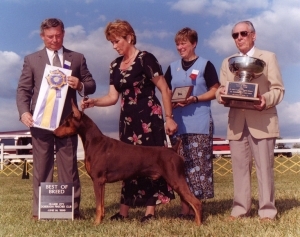 Ravenswood Betsaba was Best of Winners at the National Specialty, and #1 dog in Argentina. 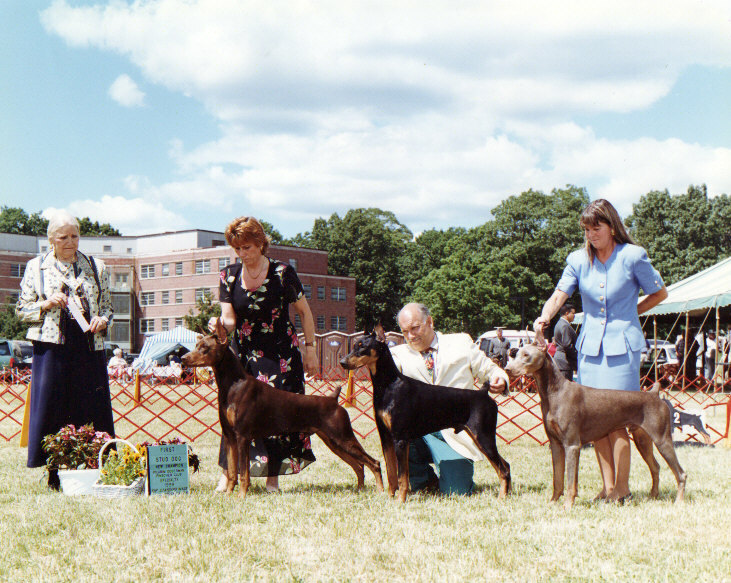 He produced multiple agility and obedience titled dogs. When I crossed him with CH. Caleb's Miracleworker, he produced Ch. 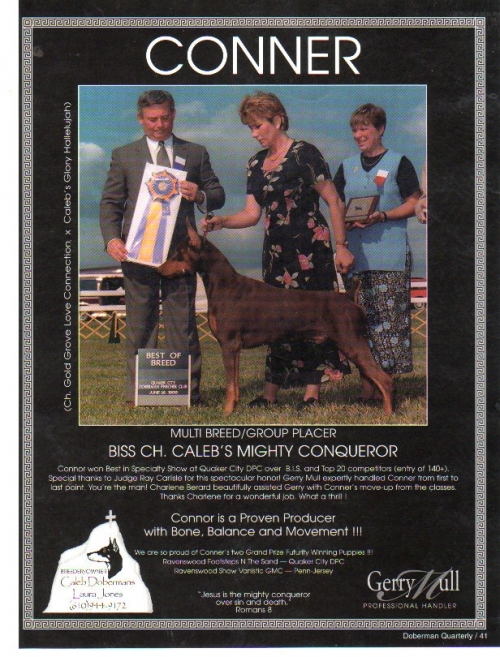 Caleb's Faithful and True GMC and CH. Caleb's Road To Redemption, both BOB winners. 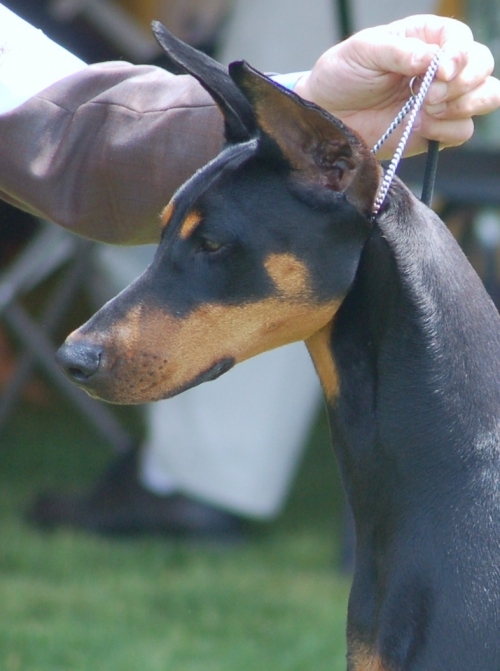 We follow the Doberman Pinscher Club of America's Code of Ethics.